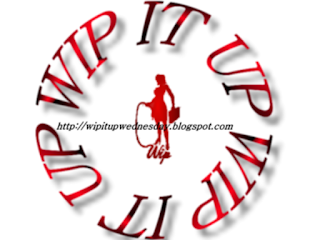 Welcome to my #WIPITUP WEDNESDAY post for this week - James & Rachel are back! As you all know by now, I have a *thing* for cowboys. When I was younger I dated a bull-rider and I was always awed by the daring bullfighters who put their lives in the hands of their colleagues, to protect the cowboys. Although a newcomer, it was obvious James was a competent bullfighter, and he took his role seriously. He was dressed from head to toe in brightly coloured clothing – from a red ribbon tied around his cowboy hat, orange shirt, lime green shorts, right down to his long stripey socks. He’d even put fluorescent laces in his spiked sneakers that he wore to give him purchase in the dusty ground. His agility was impressive. She watched, her heart in her mouth, barely able to breathe, awed by James’ daring exploits. Attracting the bulls’ attention with his over-stated movements, he’d dart aside at the very last second, enticing the bull away from the cowboy who’d only moments ago been on his back. Kara leaned over and took her hand, squeezing it. “He’s good, isn’t he?” she asked, smiling proudly. “He’ll be okay,” she reassured her, squeezing her hand again. The next cowboy out was a young rider, only eighteen, who’d just broke open late last season, atop a huge black bull by the name of Bullet. Notorious for his fast exit from the chutes and killer spin, there were only a handful of cowboys who had managed to ride him in his four year rodeo career. Rachel didn’t hold out much hope that the young cowboy would be successful in his endeavours, but she wished him luck in trying, knowing that if he did ride the beast, he could potentially win the contest. James kept close to the bull, dancing and side-stepping, a fluid mix of athleticism, courage and speed. The crowd held their breath, riding along with the young cowboy, watching in anticipation the bulls’ corkscrew spinning bucking motion. Even the announcer was silent, watching what the pair would do, battling it out in the arena. “Oh!” The collective gasp went up from the audience, riveted to their seats, their eyes fixed on the action unfolding in the arena. 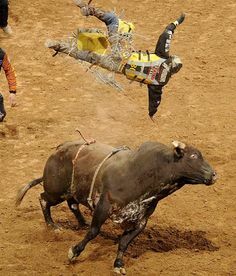 Bullet won – the cowboy got bucked off in spectacular style – flipping forwards over the bulls head, doing a somersault in the air. Bullet caught him, tossing the cowboy sideways with his horns as he flew above Bullets’ head, then lowered his head to charge. The fallen cowboy was lying dazed and bleeding not far from the bull, and the enraged animal stomped his foot in the dirt, sending dust flying, before charging towards him, intent on doing damage. Hi Kelly, great intense snippet! Definitely curious to kniw what happens next! Personally, I don't agree with the sport, but that's just me. This snippet proved what I've always thought - they guys in the ring trying to protect the riders and distract the bulls must have a massive amount of courage. Oh they definitely do! And they always miss out on the spotlight. What a thrilling ride... I mean scene. Love the danger and courage shown here.